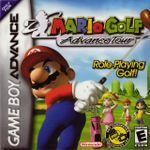 "Mario Golf: Advance Tour, known in Japan as Mario Golf: GBA Tour (マリオゴルフ ＧＢＡツアー), is an RPG-styled sports game developed by Camelot Software Planning and published by Nintendo for the Game Boy Advance in 2004. The game is the sequel to the Game Boy Color version of Mario Golf. The music was composed by Motoi Sakuraba." Source: Wikipedia, "Mario_Golf:_Advance_Tour," available under the CC-BY-SA License.